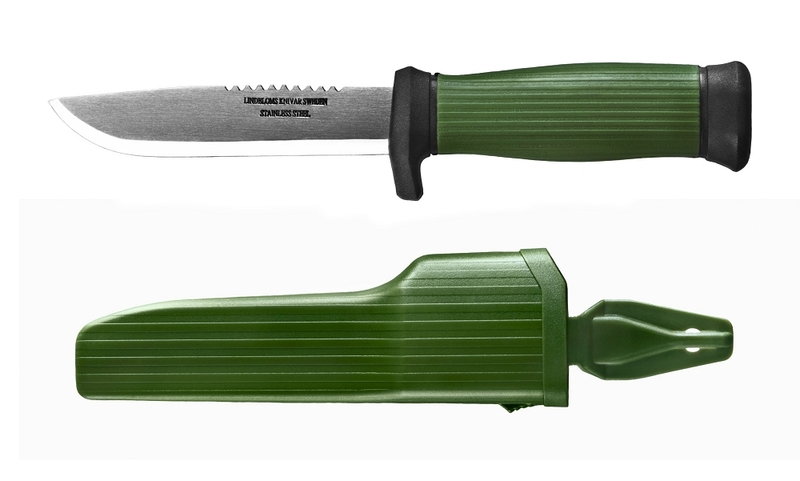 This Rugged Outdoor Hunting/Fishing Knife, manufactured by Lindblom's Knivar, is the perfect partner for those outdoor outings. The firm grip 3-layer rubber handle is made to last and provides comfort and protection for your fingers. The serrated edge on part of the top of the knife provides the ability to knock the scales off fish. The blade's 4 1/2" length combined with the 1/8" thick stainless steel blade makes this a very strong and powerful knife. The steel is of very high quality stainless steel which is hardened to HRC 58-60. Best Working Knife in the world! These Lindblom knives of Sweden are quality-wise up there with the Mora of Sweden knives. These are actually a bit beefier and larger and they are perfect for anyone who needs a strong cutting tool that has the finest quality steel that holds a superb edge. The steel and the polymers that go into these Lindblom knives are excellent and these are top-rated survival tools. The Knife is fine. The sheath is not made for people who wear wide belts.